The CTD Film Festival got an extra boost this year, thanks to summer intern Josselyn Sosa. A radio/ television/ film major at Stephen F. Austin University, Josselyn reached out to the Festival earlier in the year to inquire about getting involved. 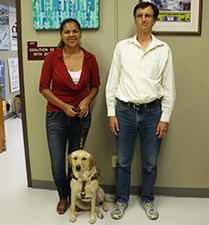 With Seeing Eye dog Nasha in tow, she spent a month in Austin working with Film Festival coordinator William Greer on outreach and publicity for the 2013 season. During her time with CTD, Josselyn maintained the Film Fest Facebook page (with a little help from Nasha), developed traditional media contacts, performed in person outreach around town, and much more. She completed her internship with a private tour of the Alamo Drafthouse Village and a visit to the Austin Film Society, networking like a pro the whole time! Josselyn consistently impressed us with her speed at her assignments and her enthusiasm from day one. We wish her well this fall semester and can't wait to see her and Nasha in November for the Film Fest!